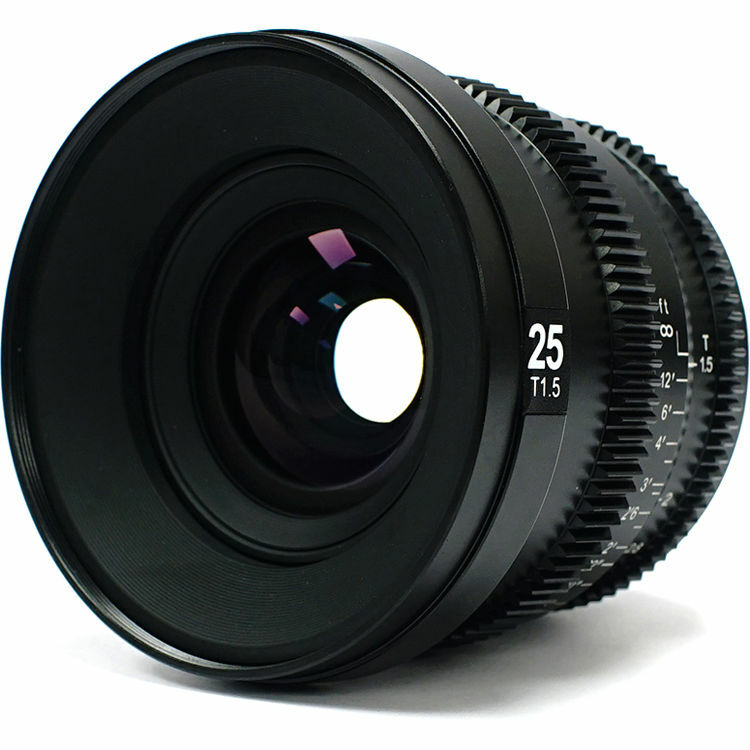 Choosing a smaller size over bulk and weight, the SLR Magic MicroPrime Cine 25mm T1.5 Lens covers Super 35 sensors and features a Fuji X mount. Suitable for 4K origination, each lens in the MicroPrime Cine series features similar size and weight with consistent lens gear positions for rapid lens changes and easier rebalancing when changing lenses on a gimbal. The lens provides a pleasing bokeh with natural-looking out-of-focus highlights. The odd number of iris blades also reduces the appearance of flare off the blades. The lens has an internal focus design so the front of the lens doesn't rotate when focusing, and it has an 82mm filter thread for compatibility with a wide number of filter options. Each lens in the MicroPrime Cine series features similar balance characteristics, minimizing recalibration when switching lenses while your camera is on a gimbal. Internal focus mechanism minimizes breathing and prevents the front of the lens from rotating while pulling focus. An 82mm front filter thread enables mounting filters directly to the lens without using a matte box. Box Dimensions (LxWxH) 5.4 x 5.2 x 5.2"
MicroPrime Cine 25mm T1.5 Lens (Fuji X Mount) is rated 5.0 out of 5 by 1. Rated 5 out of 5 by Alex from Beautiful color rendition, sharp Man! this is a cine lens, beautiful characteristics almost cookes like. Color rendition is just right paired with Fuji color science, soft sharp pasty (Arri) look. minimal focus breathing. Gear rings are smooth and metal housing is quality. I will def pick up the 35mm (50mm equivalent) once its back in stock. What is the focal length equivalent? The Fujifilm X Mount system is for cameras with an APS-C sized and a 1.5x crop factor. This lens will have the equivalent of a 37.5mm field of view. Hi! What is material of this lens?